In Part 2 of my Going All Grain Series we will discuss the equipment that is needed to start making AG beers. If you missed Part 1 check it out - Part 1 - What is All Grain? Unlike extract beers, which you do a partial boil and then top-up with water, AG requires you to boil your full volume of wort. Taking evaporation into consideration, a full boil for a five gallon batch of beer will start off with at least 6 gallons of liquid. This larger volume of wort causes an instant need for equipment that you may not own, since it was not needed in extract brewing, such as a larger brew kettle and a way to cool 5 gallons boiling liquid. AG brewing also requires you to mash grains which involves holding the water and grain at a constant temperature for about an hour. Restaurant Supply - Restaurant supply stores will carry a wide variety and size stockpots in aluminum or stainless steel. This is the route I went and I purchased through the online vendor Instawares.com. Price varies on size ~$75 for a 10 gallon and ~$90 for a 15 gallon aluminum pot. Keggle - Legally obtained decommissioned 1/2 Barrel Kegs can be used as brew kettles. All you need is the right tools and a little DIY to cut to top off. Price can range from free to $100 or so. Dedicated Brew Kettle - These kettles are generally sold by your Local Home Brew Shop. They are made of stainless steel and come with ball valves and thermometers attached. They range from about $200-$400 depending on size. Smaller Batch - Looking to go AG on the cheap? Don't scale up your brewpot, scale down your batch size! If you already have a 5 gallon pot you can easily make 2.5-3 gallon all grain batches! Mashing Vessel - to conduct the mash you need a way to hold the grain and water at a constant temperature for about an hour. You will additionally need to create a method that will allow you to drain the liquid, but leave the grain. I won't cover these devices, but they can be had for $10 - $20+ depending on your chosen method. Separate Kettle - In Part 3 of this series we will discuss Recirculating systems which use another brew kettle to act as the mash tun. Wort Chilling - It is a lot harder to cool down 5 or more gallons of boiling wort than it was to cool down that 2-2.5 gallons, which was conveniently in a pot that would fit in your sink! 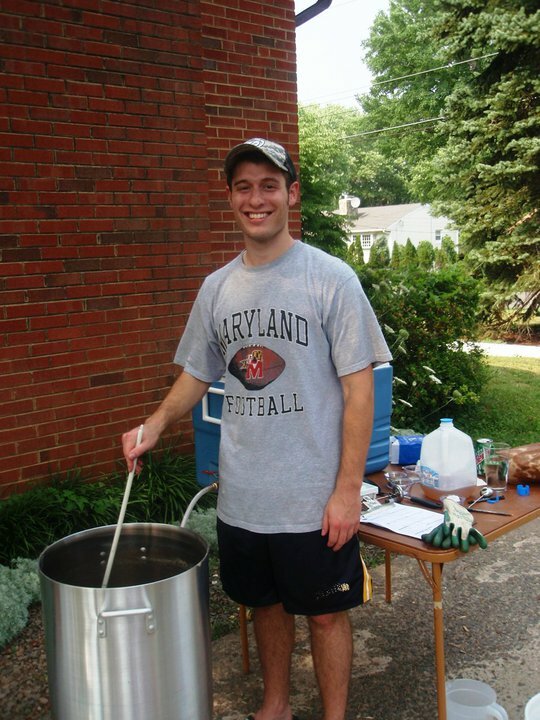 Homebrewers are a pretty smart group of people and have come up with a handful of different ways to cool wort quickly. If you are going that 2.5 gallon batch route, you keep on doing what you been doing! No Chill - A method of cooling the wort by transferring it after the boil to a plastic fermenter that can withstand the heat. The brewer then lets the fermenter sit in the closed environment and pitches the yeast the next day when the wort has cooled down. This method will sanitize the fermentation vessel. $0 (assuming your vessel can accept 200+ degree wort). Immersion Chiller - A Copper Coil placed in the wort which has cold water run through it. 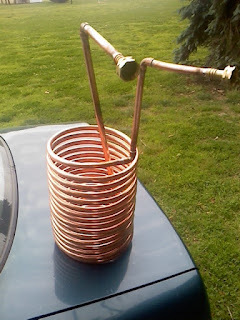 Copper is a good conductor of heat. As the cold water runs through the copper coil, heat is transferred from the wort into the water inside the chiller. Hot water comes out of the chiller and your wort cools down. Immersion chillers work best when the wort is moving. This can be done by whirlpooling the wort with your brew spoon, or automtically like Jamil Zainasheff does. ~$70-$130 depending on size and if you employ DIY. Way to cool the wort. For the money conscious brewer, go out and get yourself a five dollar bag and make some 2.5 gallon batches! If you want to stick with 5 gallon batches, look to spend about $200-$250 to get into All Grain brewing. You can always buy bits and pieces here there until you have everything required to make the jump.